Are Chemical Companies More Important Than Voters? A Kauai resident struggles to find answers from lawmakers about the spraying of pesticides on his island. I’ve been on a long journey for many years. But I have not reached my destination. Year after year I have testified in front of the Kauai County Council. I have flown at my own expense to Honolulu to testify at the Hawaii State Capitol. My message has not changed. But I have not received a satisfactory answer. I have met with representatives of the companies that are responsible for the clouds of dust in which we live and which we breathe: Pioneer, Dow, Monsanto, Syngenta. But still, we get no answers to our many questions. No response to our cries for help. We have no idea what is in that dust through which we travel, which settles on our window ledges and our door handles and our homes and furniture. But we smell it. We live in it. And we are very afraid. 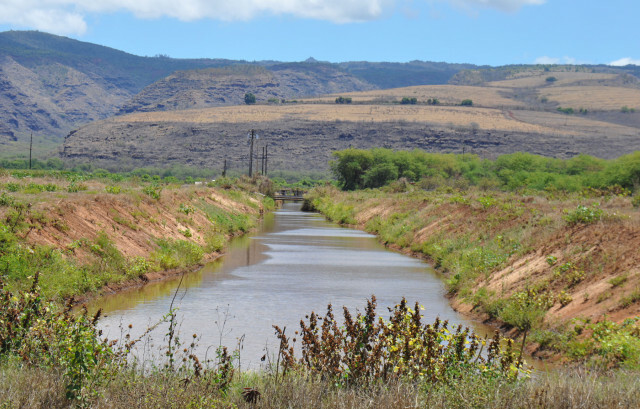 Water flows near DuPont Pioneer’s now-shuttered parent seed facility in Kekaha, Kauai, June 2015. I was driving in my truck recently with my son and we got that smell that we have learned to recognize. Later I made a report. I am not trying to get anyone in trouble. I just want to protect my family and my friends and neighbors. I found out that pesticides had been sprayed some distance away, but the winds had carried the smell, and the chemicals — whatever they are — to our noses and our neighborhoods. Don’t we as the people who live and work there have a right to know what is being sprayed literally in our faces? When I ask that question, I get many different answers, but not one that provides a solution. It’s not easy to talk to these companies. They give you a song and a dance. They tell me one thing, they tell the County Council another, and they tell the state authorities something else. I feel like I am smashing my head against a wall. Sometimes the spraying has gone on for three weeks straight, morning and evening. During the growing season on Kauai, it goes on for four to five months. Why are we not notified? Why are we not told what is being sprayed? Do we, the people who have lived here for generations, not have any rights? Why do the companies that come here to test their pesticides on our land have more power than we, the people? Is their freedom to make a profit on our land more important than our right to not be doused with chemicals day in and day out? Why are we not notified? Why are we not told what is being sprayed? It’s been a long journey. I am tired, but I am not giving up. I just have to ask who our elected officials are listening to: the people whose votes they asked for, or the companies who donate here and there. The companies think jobs and donations are enough to keep us from complaining that their “agricultural activities” are destroying our children’s health. No, it’s not enough. No job, no donation, no handout at fairs and carnivals can make up for destroying our health. I ask once again: Who are our legislators listening to? Who are they accountable to: we, the people, or the corporations with a lot of money? Tell me that, and I will know if I should hold on to hope that we will get justice. I don’t want to keep feeling that I am just smashing my head against a wall. I hope to see some answers finally out of this legislative session. So, once again, I come to Honolulu, bringing my story and my neighbors’ stories. And once again, we say, do something. This is what I know I gotta do, or my mother will be disappointed. 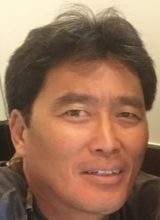 Klayton Kubo is a resident of Waimea, on the west side of Kauai.